Sarah Ghelfi is an experienced hair colorist , certified educator, make up artist and bridal/photoshoot stylist. 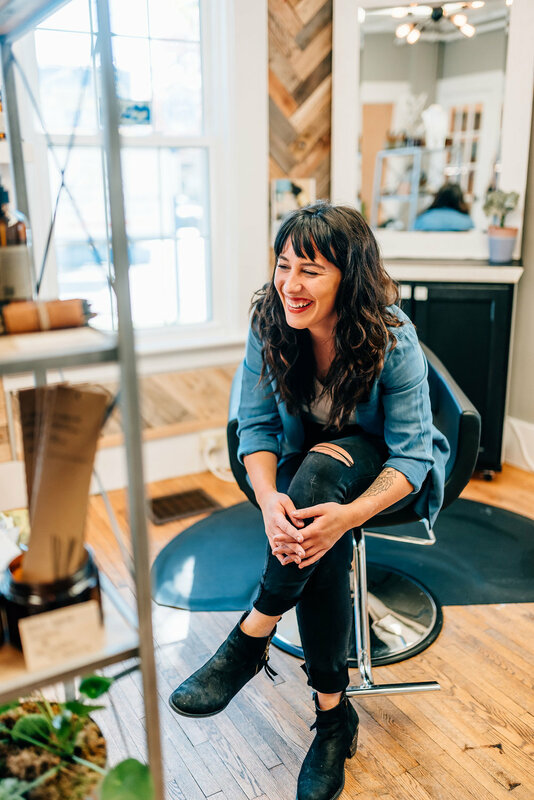 Sarah attended Empire Beauty School in 2012, and studied at Aveda's advanced education center just outside Boston to get her hair color educator certification. She also recently got certified as a holistic hair colorist with Simply Organic Beauty. In 2016, Sarah was voted into the top three hair stylists in the Mount Washington Valley, ultimately winning second place out of all of the stylists in the greater MWV. Sarah enjoys the art and science of hand painting the hair, resulting in unique, beautiful and specialized hair color with results ranging from extremely natural to vivid and high fashion. She prides herself on staying educated on today's latest cutting and coloring trends and techniques. When she's not doing hair, you can find her in the mountains with her dogs, or hanging at home with her family. Sarah is committed to offering her guests a non-toxic, holistic, organic, and relaxing experience. We are currently looking to add talent to our team! Contact Sarah for information. 603-520-3013. Finn is our official shop dog & mascot. He enjoys coming in, mostly to sleep on his bed & gently say hello to our guests. When he’s not at Lotus, he loves getting out into the mountains with Sarah and his brother Wilder.